First Month of my Year Abroad! – Katie Louise | Graduate Life tbc. There have been times when I’ve questioned ‘whose silly idea was this year abroad business anyway! ?’, but there have been times where I can truly say I have felt like the luckiest person in the world! Sorry for the cheesiness.. 😉 but it’s absolutely true! This is probably the scariest thing I’ve ever done, travelling just over a thousand miles on my own, finding a flat here, getting to know other students, attempting to speak the local lingo and most challenging of all trying to integrate with a new culture! 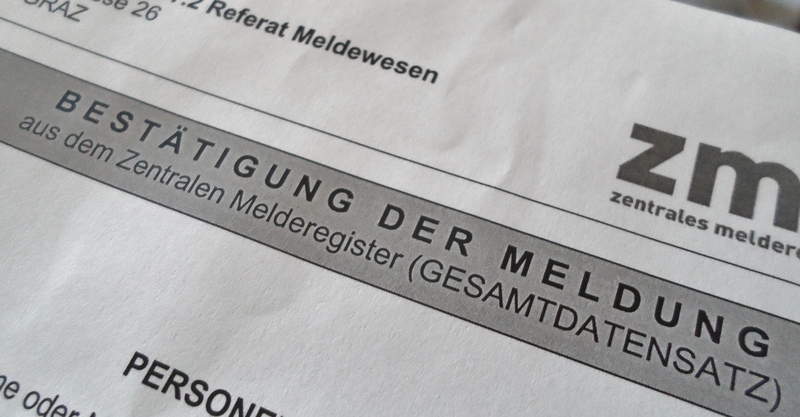 There has been lots of admin, forms and such to sort out the past couple of weeks, including registering as a (..Bewohner..oh dear what’s the English word… this is becoming a rather frequent occurrence.. *google translates*) RESIDENT. This involved just a seemingly quick visit to the Meldesamt (where you have to go to apply to register in the city). It was a rather strange situation whereby I walked into an office full of Austrian women chatting away, then, after a brief pause of thinking I was most likely in the wrong place, one of them read my slightly confused face and led me into her office. She proceeded to jabber something in a very heavy Austrian German dialect, (one of those classic smile and nod situations that one often has to pull out of the bag), but after checking my passport and various documents it was all done and dusted in 10 minutes or so! One major thing for me the past two weeks has also been my intensive German course. 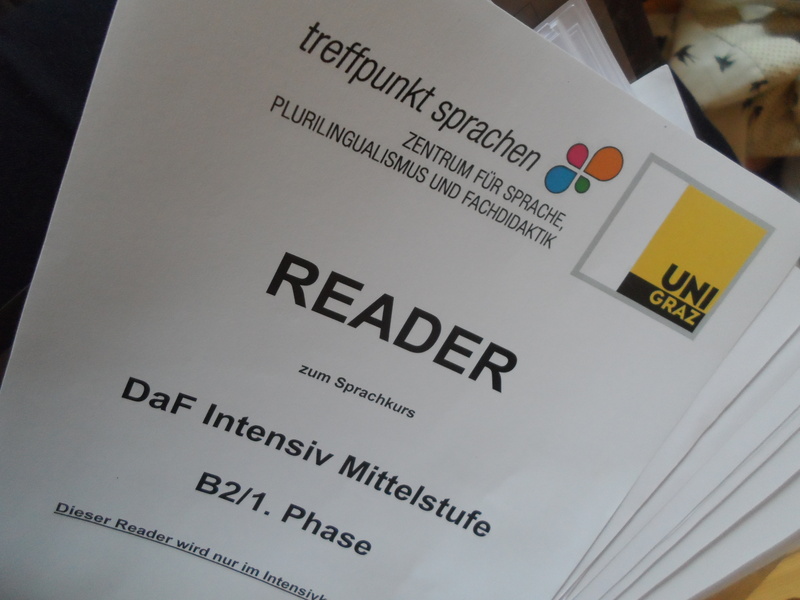 I decided to do this course before starting university properly, in order to integrate myself a little better with the language before being in all German lectures (scary thought!). I did have to pay for this course, but it is three weeks long in total and I can honestly say that it has been worth every single penny! At first it was a bit stressful as we all had to take both a written and a speaking test in order to place us in the right level class. The class levels use the CEFR (Common European Framework of Reference for Languages) that go from A1 beginniners, then A2,B1,B2 and to C1 which is near native fluency. After my tests I was placed in the first of two stages of the B2 level, which I was happy with as this is where I would have guessed I should be at by now! 🙂 and as the course is intensive level, it runs from 9-12 Monday to Friday for three weeks (shock to my body clock indeed!). The first lesson was all a bit scary, for most of us didn’t know anyone else there! But after the ‘icebreaker’ introductions and such, it didn’t take long till we were pretty well acquainted! The course has covered a variety of different topics and has included a lot of grammar tasks, presentations and discussions in class, which has been really great, because everyone has the chance to speak up and get involved! By nature I have always been a quiet person, so speaking up in front of people has always been a challenge, but something really clicked for me being in this class, whereby I really feel like we are all there to learn, so why bother caring so much about making mistakes or sounding silly?! Everyone in the class has just been so nice and I have loved getting to know so many different people from different countries, and being able to learn about everyone’s different languages and cultures has been so interesting! I honestly think I have spoke more German in the past few weeks than I did the whole of last year! It’s just absolutely crazy, yet so exciting! Our teacher from the German course also took us out on a hike up a mountain close to Graz one afternoon, which was really good! It was nice to get a chance to speak to fellow classmates in a more casual environment, and of course ‘auf Deutsch!’ It was a really super sunny day, and in all honesty if it was that hot and sunny at home I probably wouldn’t have considered moving from my garden (typical British not used to such heat!). 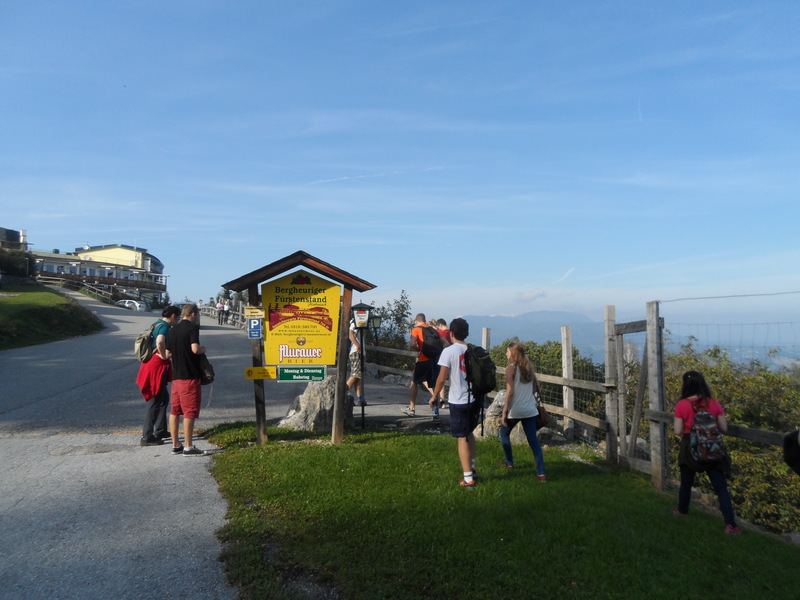 Despite the fact that after the hike I had a rather horrific bout of heatstroke, I actually really enjoyed it! 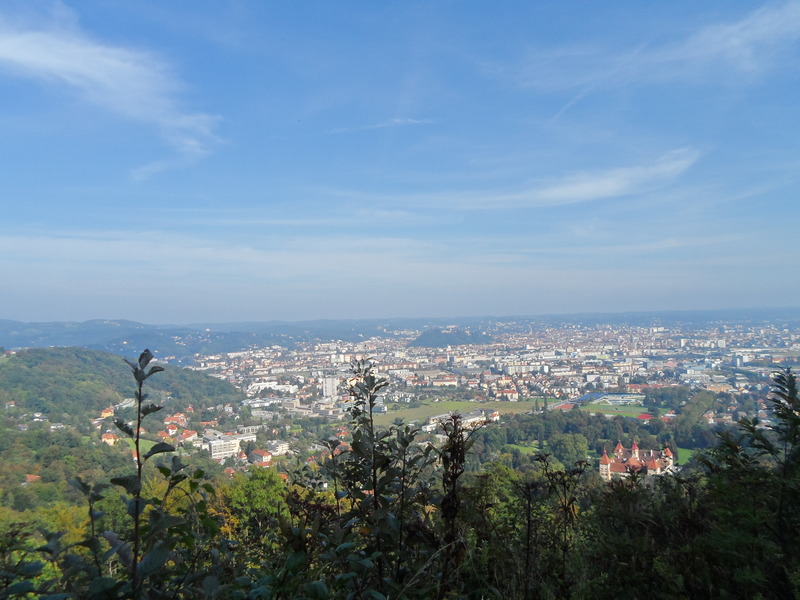 The mountain was called Plabutsch and the walk was quite hard at parts, rambling through the forest and up slippery slopes, but once at the top, sitting on the restaurant terrace, we really did get an amazing view over Graz and beyond! It’s quite nice just to sit and reflect about the past month; of course at times it has been emotional and overwhelming, but more often than not I just find myself stopping and really being truly grateful that I get to be here, meet so many great new people and experience a new culture! After this final week of my German course I have the final tests, and then shortly after my university courses start for real! Of course it’s nerve-racking, but really I’m quite looking forward to getting into it! Thanks for reading and I really hope you are enjoying following me on my third year abroad adventures! Click on the WordPress button on the sidebar to subscribe to receive notifications when I post, or follow me on Twitter @KatieGough1705 to keep up with all my latest updates. I’m jealous of the weather there. Lancaster is getting chilly.